Our homes should be a safe place. Ideally, the home is a place to unwind, to relax and to breathe freely. However, many times, we are unaware of the hazards that surround us at home. At Exercises For Injuries, we want to help enable you to make positive changes to rid your sweet home of toxic chemicals and help you find solutions to make your home a safer haven. Here are our top tips to make your home healthier. You already know that plastic should never go in your dishwasher or microwave. However, did you know that researchers have found that most plastic dishes can release a chemical that mimics the hormone estrogen when used to store food and beverages? The study also suggests that even bisphenol A (BPA)-free plastic containers can leach chemicals into our food. While scientists continue to research the effects of plastic food storage containers on our pantry staples, let’s banish them from our kitchens. Just get up from wherever you are right now and start digging through the cabinets. Take all the plastic containers, sippy cups, mixing bowls and utensils and toss them in the recycling bin. If that means a trip to the thrift store in the morning so you can replenish your shelves with glass jars and drinkware, so be it. You’ll feel so much better drinking out of glasses and storing your leftover organic strawberries in one-quart mason jars. They’re so much cuter too. Nonstick pans are normally aluminum pans dipped in a thin coat of a synthetic polymer called polytetrafluoroethylene (PTFE). PTFE is also known by the trade name Teflon. According to the Environmental Working Group (EWG), nonstick cookware can release toxic fumes at high temperatures. Some have even reported developing flu-like symptoms after standing over these fumes for extended periods of time. Scientists have called the symptoms “polymer fume fever.” There have also been cases of pet birds dying from their cages being placed too close to the stove where nonstick cookware was in daily use. Choose cast-iron or stainless-steel pots and pans to avoid these toxic fumes from nonstick pans. Most professional chefs agree that both stainless-steel and cast-iron cookware brown meat better and offer a more even cook than nonstick pans anyway. English ivy: This is a climbing vine that thrives in low sunlight and small spaces that is perfect for window-less rooms and bathrooms. English ivy is excellent in homes because it absorbs formaldehyde, which is a very common indoor air pollutant found in carpeting, furniture coatings and synthetic home goods. Boston ferns: These are also good at absorbing formaldehyde. These plants have feathered leaves and grow well in hanging baskets. This would be great to hang in the kitchen or near a window. They need moist soil and lots of love. Golden pothos: This is another fantastic indoor plant. It’s a fast-growing vine that you can train to climb around most any fixed object in your home. It can be placed in a jar of water or in dirt to grow. It thrives in full sun or no sun at all, meaning it’s hard to kill. The golden pothos is a fantastic choice for purification because it absorbs carbon monoxide and benzene. It’s a great plant to put near the garage, where car fumes can sneak into the home. Head out to your local nursery today with a list of these plants. Then, pot them and put them to work. Open up the windows as much as possible and let Mother Nature’s little helpers rid your home of indoor pollutants. Sure, carpeting is pretty and soft for the feet. However, it isn’t healthy to have in your home. Not only are there a slew of dust mites, microscopic bugs, organisms and overall nastiness hiding in those synthetic fibers, carpet also harbors an alarming number of chemical toxins. This includes acetone, benzene, toluene, formaldehyde, styrene, ethylbenzene and more. These are recognized carcinogens that can cause nerve damage, reproductive problems and hallucinations. Consider greener options like bamboo, tile and cork flooring. All three of these are nontoxic, durable and renewable. If you need some softness, there are natural rugs on the market these days. Most are made from sisal, hemp or seagrass. These are great choices for families with small children who may need a soft place to land. Be sure and take some time to research the company and make sure you are buying a rug that hasn’t had any harmful chemicals applied during the manufacturing process. Mix these powders together, and you’ve got yourself a powerful automatic dishwashing detergent. Use white vinegar in the rinse-aid compartment and also in an upside-down cup on the top shelf of the dishwasher. The vinegar in the cup will splash out during the wash cycle to keep your dishes clean and disinfected. Mix all of the ingredients in a good quality spray bottle. 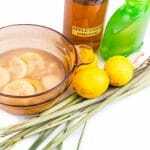 You can add other essential oils, like orange or lemongrass to enhance the scent or effectiveness of this cleaner. Have fruit flies invaded your kitchen? Add in some clove oil. They’ll be gone the same day you spray it. Do spiders hang out in your basement? Add several drops of peppermint oil to the cleaner, and they’ll leave. If you’ve got a problem with any other type of bugs in your home, add a little cedar wood essential oil to the cleaner. Most bugs and pests will stay away from cedar wood. I also like to add in a capful of cheap vanilla extract for the pleasant scent (use the kind without sugar added). The beauty product industry is virtually unregulated. There is very little review or approval process for the ingredients companies throw into their “health and beauty” products before they hit the market. Do yourself a favor and scrutinize the ingredient lists of your shampoos, lotions, soaps and bubble bath solutions to make sure you’re not lathering up with synthetic dyes or worse. Parabens: These are preservatives often used in cosmetic products to prevent bacteria growth and spoilage. They are easily absorbed through the skin and have been linked with an increased risk in breast cancer. Propylene glycol: This is an alcohol that’s used as a skin conditioner. It is a skin-irritant that has been shown to cause dermatitis and hives in humans. It’s found in lotions, makeup, shampoo and other hair styling products. BHA (butylated hydroxyanisole) and BHT (butylated hydroxytoluene): These are synthetic preservatives used in all sorts of cosmetics. Both ingredients can cause allergic reactions on the skin. BHA has been shown to interfere with hormone function and is a possible human carcinogen. BHT is being studied for its possible adverse reproductive effects and overall toxicity. Sodium laureth sulfate (SLES): This is an ingredient that makes our shampoos nice and sudsy. It helps enhance bubbles and foam for body wash and bubble bath solutions. However, it’s often contaminated with known carcinogens that can interfere with human development and cause nerve problems. Triclosan: This is often used in deodorants, soaps, toothpaste, body wash and other cosmetics. It’s suspected that triclosan interferes with the body’s hormone production and may contribute to antibiotic-resistant bacteria. Toss all products that contain these nasty chemical ingredients that can harm you and your family. When you shop for new personal care products, read those labels just like you would read the labels on packaged food. These days, pure and natural skin care options are available at most stores. Here’s a rule of thumb for skin care products: if you wouldn’t put it in your body, you should avoid putting it on your body. 7. When Is the Last Time Your Mattress was Replaced? Please don’t get mad at me when I tell you that your over-the-top comfortable memory foam mattress might be emitting 61 scary, noxious chemicals including benzene and polybrominated diphenyl ethers (PBDEs). It’s true that many of us are sleeping on mattresses that are made up of various petrochemicals, synthetic latex, plastics and flame-retardant chemicals. Because we do spend a great deal of time snoozing under our organic cotton sheets, it’s a good idea to consider swapping out an older mattress for one of the newer, more natural types. The good news is that there are very comfortable, natural and healthy mattress options out there that won’t cost you a fortune. If you can find a mattress made from natural fibers, like wool or cotton – that’s a plus. Also, 100% natural latex is made from rubber trees, and it’s much safer than synthetic latex blends made with polyurethane. Many futon mattresses are also made from natural materials. Check to ensure the mattress you are considering is certified by a third-party group that oversees mattress manufacturing practices. Just making some of these small changes around the house can impact your health and the health of your loved ones in major ways. Take some time this week to take inventory of your home. And make adjustments as necessary. Do your best to ensure that your home is a place where you can enjoy a peaceful, healthy retreat.